20 November, Johor Bahru – Congratulations to Mehedi Hasan from Faculty of Engineering for winning the October Mobile Phone Competition. 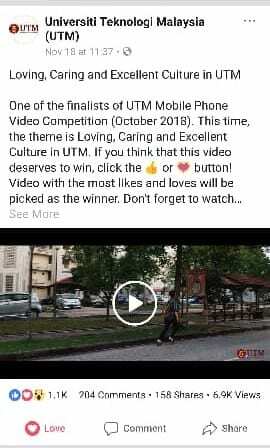 The theme for the October competition was “Loving, Caring and Excellent Culture in UTM”. 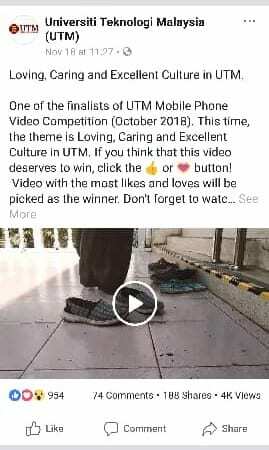 Mehedi was automatically picked as the winner for the October Mobile Phone Competition as his video received the most Likes on UTM Facebook at the closing time at 11.59pm on 19th Nov 2018. It was a very tight competition but Mehedi’s video received 1.1k Likes at the closing time while the other video received 954 Likes. Mehedi will receive RM500 prize and a certificate from the UTM Office of Corporate Affairs.